Is your smoke detector obsolete or broken? Are you continually resetting the smoke detector because of beeps or false alarms? Contact our trained electrical experts to assist in your smoke detector repairs, replacement, upgrade or installation. It’s easy to forget about smoke detectors, even though they are life-saving devices. All the smoke detectors on ceilings and walls throughout your home silently keep your family safe. There are two basic types of smoke alarms – those providing a visual and/or audible warning inside a house or building, and those wired to a monitored fire alarm system alerting emergency personnel. 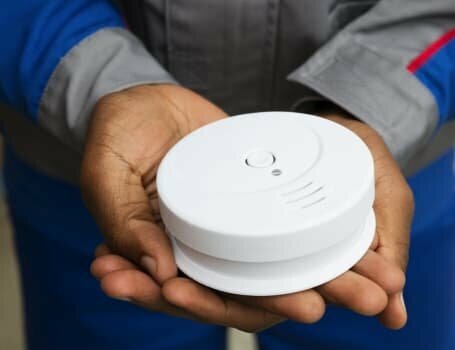 Most homeowners have smoke detectors set up to alert everyone in the home; they do not connect to police or fire departments. By a combination of both photoelectric detection and ionization. The National Fire Prevention Association (NFPA 72) fire code specifies the correct procedures for smoke alarm installation. The location of smoke detectors is based on where people in a home or commercial building are most likely to hear the alarm. Laws governing smoke detector placement vary between municipalities. Some require smoke detectors in stairways, main hallways, and garages. New construction properties have more stringent requirements. The NFPA focuses on improving fire safety standards for new houses and commercial buildings. New smoke alarm requirements include hardwiring alarms to the power supply. In addition, they must have battery backup. Smoke alarm systems wired into the basic wiring connect to each other, which means they all sound an alarm when one identifies smoke. Alarms installed in older homes are usually single, battery-operated units. 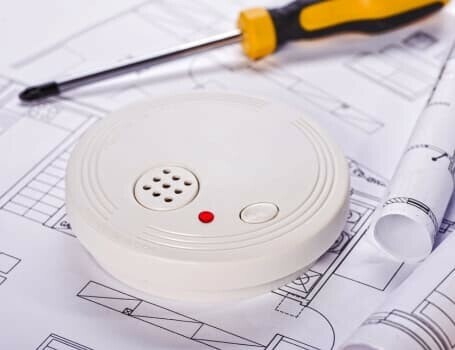 Installing wired smoke detectors can become a complicated remodeling project, that involve removing walls and ceilings throughout the house. In the United States, smoke detectors are required on every occupied level, including accessible attics. The law also requires installing smoke alarms on each level with a bedroom. In Canada, smoke alarms are required on each level of a home, but their location is not specified. It may not be necessary to repair a smoke alarm. Single, battery-operated alarms are not expensive, and most people choose to replace them when they stop working correctly. However, repairs may be necessary on smoke alarms that are hardwired to the power source and connected to other alarms. This repair work is best suited for a licensed electrician. 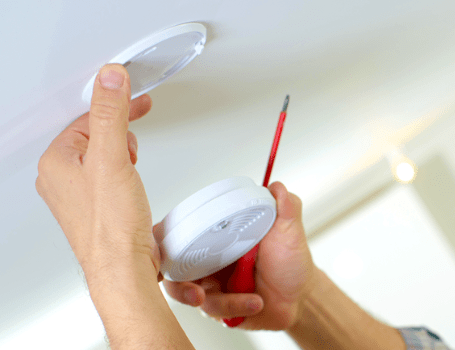 Replacing the batteries with either type of smoke alarm is a simple procedure. You hear an intermittent chirping sound when a battery is getting low. As soon as you hear that sound, it’s time to buy and install new batteries. Fire safety experts recommend replacing your smoke alarm batteries every six months. It’s easy to remember if you coordinate battery replacement with the dates when Daylight Savings Time begins and ends each year. Speak with one of our qualified electricians today about your electrical problem. Sometimes a new smoke alarm battery is not the solution. Deciding to upgrade to a new device will bring you peace of mind as it protects your family. Mister Sparky electricians have years of experience working with customers to install and replace smoke detectors. Both battery-operated and hardwired smoke detectors can keep you and your family safe. We make sure your smoke alarms are installed and working correctly. Very friendly and knowledgeable technician. They were prompt and organized. I thought they were a little pricey, but I've yet to encounter a cheap electrician!— Janine T.
I thought it was kind of expensive to screw an electric bolt to the side of the house. It took no more than 10-15 minutes to erect the ladder, climb it, screw the bolt in, and take the ladder down.— Emilie L.
The electrician was great and explained each step in the process as he moved through the work. He did a great job of cleaning up after the work. The wiring installed under the sink was in metal casing to protect is from potential leaks. I have not had an electrician in for a long time, so my knowledge about cost is not current, but I felt it was a bit high. 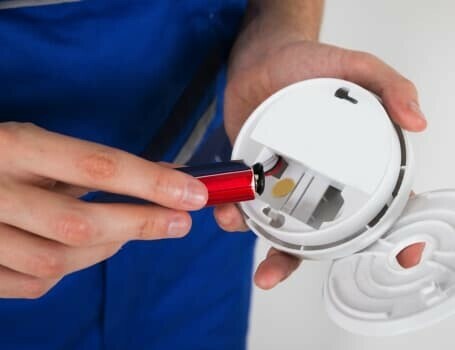 However for quality of work, timeliness in terms of projected arrival, focus on the task, including not taking phone calls; clear explanation of work, and clean up, I would highly recommend the company.— Chuck S.
How Can Our Professional Electricians Help with Your Smoke Detector Installation, Inspection, Or Replacement? Mister Sparky electricians are licensed and insured to get your job done right. If we don’t arrive on time, your electrical repairs are free! We are a locally owned company that provides 24/7 emergency and weekend service for no additional charge.